Welcome to Extreme Chase Tours, We have been offering Professionally Guided Storm Chasing Tours, Tornado Tours and Storm Chasing Vacation Adventure Travel since 1999. We provide the most personal and affordable small group Tornado Tours that are 6 to 10 days in length. Our Storm Tours and adventure tours are truly the most affordable storm chasing vacations that you will find anywhere! We also offer Severe Weather Photography Tours and we were the first to offer these types of tours. 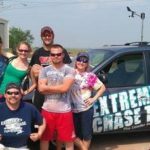 The Extreme Chase Tours storm chasing tours team are highly experienced decorated storm chasers and meteorologists who are truly severe weather experts. This experience and real one on one attention is what sets us apart from many other storm chasing tour companies. While there are many Storm Chasing Tour Companies to choose from, we, are the most personal and most affordable! NO OTHER big Storm Tour company will spend MORE ONE ON ONE TIME WITH YOU! We believe in quality not quantity - Our Weather Adventure Tours are designed with a more personal touch and real one on one interaction with all of our chase tour guests! Come join one of our 2017 storm chasing tours and you will be going with a tour operator that has almost three decades of Tornado chasing experience! We want you to have the best storm chasing vacation possible. 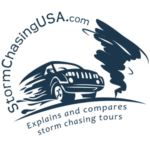 Simply stated: WE ARE THE MOST PERSONAL STORM CHASING TOUR COMPANY IN THE BUSINESS! The difference we offer is a true educational experience, we spend one on one time with each one of our guests teaching them not only how to storm chase and what stormchasing is really like but also how to read radar, storm structure, past events, basic photography, how to "read" a storm, basic meteorology etc. We teach our customers everything they ever wanted to know about tornadoes, severe weather and storm chasing. We also offer one on one private tours as well as full media tours, Follow Along Tours. We are also the only company to offer tours based on our customers needs and wants. This includes booking tours based upon a customers vacation, personal or productive time. Although we offer a set schedule, we book our tours based on what our customers need! We believe that quality not quantity is key to our customers successful tour and the reason why we have a 77% guest return rate. Why choose Extreme Chase Tours? We have almost 30 years experience! Documented over 500 tornadoes to date! 77% guest return rate due to our personal, private attention! The start date does not necessarily mean it is a chase day, although this is typically the case. The end date could be a chase day but typically, it is not. Do not schedule your flight according to the dates given here. Always double check this with the tour operator before you book your flight! Prices could be subjected to discounts. The tours could be full and you may not be able to book it. There are currently no deals or discounts available. The blue van have In-vehicle monitors that will allow each person in the vehicle to watch the same radar and data the leader is looking at. If you have been on a tour with Extreme Chase Tours, please write a review. This was my fourth time with Extreme Chase Tours. I had gone at different times of the year but twice now on Mayhem 4. This by far was the best tour ever! We saw funnel clouds almost every day and we were actually near/in a tornado on our 6th day! We were never in harms way and the video that one of guests took was featured on Good Morning America and other media outlets. I plan on going again at the same time next year! We had such a great time with everyone that was on the tour and by the end it was hard to say goodbye to everyone, it felt like family . Lanny was a professional all the way as far as I was concerned. He stopped when we needed to and took the time to teach us what to look for on radar and in the cloud formation itself. I learned a lot. We laughed a lot and he always made sure we were comfortable, we didn't have any issues with the rooms etc where we stayed. The two vehicles we took were very comfortable and we all had enough room as well as for the luggage since at one time we had 12 people, 6 per van including the drivers. I've always wanted to see a tornado, And with Extreme Chase Tours, I did. But I didn't just see a tornado (which was spectacular in its own right), I learned so much. Every question I asked, no matter how elementary, was answered patiently and respectfully by our host and tour operator, Lanny Dean. I asked him a ton of questions (curious mind, and all that), including about his fascinating research in the infrasonics of tornadoes and supercells. Talk about esoteric! But Lanny explained it in layman's terms for me and I understand the broader outline of what's he's working on. Our vehicle was well-equipped, spacious and there was a monitor in the backseat to see what Lanny was talking about. We took enough bathroom stops to prevent the long rides from being uncomfortable, On down days, we saw the local sights, which to me, since I'd never been to this part of the country before, were almost as interesting as the weather. I would recommend this tour to anyone who wants to be guided by an extremely knowledgeable tour operator and hopefully will see a tornado. I obviously don't know the other tour operators, but I couldn't imagine anyone being more knowledgeable, polite, considerate and professional as Lanny Dean. He even checked our beds for bed bugs, I mean, who does that? (And no, there weren't any). Every place we stayed was clean and had decent amenities. He was friendly, but not buddy-buddy. (I wasn't coming on the tour to make friends, but to see and learn.) He told great stories based on his experiences—super interesting and, at times, amazing. He has won just about any time of award there is in this business,, His images are picked up my media outlets throughout the world. I even found a couple of his photos on esoteric Russian scientific journals. I highly recommend touring with Lanny. I hope to do it again soon. The vehicle was a Dodge Caravan that was clean and well-maintained. It was comfortable and Lanny only puts 4 people per vehicle, so everyone gets a window seat. I understand some companies have so many people in each vehicle that the leader needs a microphone. A lot of intimacy and the chance to ask questions seems to me to be lost that way. I booked with Extreme Chase Tours for their Great Plains Tour and wow this tour was wonderful. It was professional when needed to be but very relaxed and fun at the same time. It was very comfortable and you can tell that safety is Extreme Chase Tours number one priority. Not once did I feel unsafe or uncomfortable. After getting home and before doing this review, I really tried to think of anything that I didn't like or be biased in any way. And I just couldn't! These guys know what they are doing and run a wonderful outfit. Upon booking the tour, we communicated through email but also directly on the phone ultimately, which made me feel so much more comfortable and gave the essence of personality from the start. That is the reason I chose Extreme Chase Tours, they boasted that they were the most personal tour company and I have to say that from the start all the way through the end of the tour that is exactly what we got! As far as the storm chase tour, we didn't have the best weather to start with. And as Lanny explained, it was "Mother Nature doing her thing but to be prepared for around the next few days June 11-12th timeframe because it looked good." With a few of what they called down days, which we spent sightseeing and visiting some pretty cool places, the morning of June 12th we awoke in Northeast Colorado and by that afternoon we had already seen 5 tornadoes in 3 different states of Colorado, Nebraska and Wyoming! I am still trying to process some of the sights and sounds and experiences of the tour itself. And I suspect I will be a for a long time to come. I had nevr seen a tornado until this tour so this was a bucket list type deal for me. I am so glad I chose Extreme Chase Tours, not just for the storm chasing aspect, but because they do operate a wonderful business and provide exactly what they say they do. The Tour guide (Lanny) was very knowledgeable about the weather and knew exactly where we needed to be to see the tornadoes and two or three supercells as he called them. He was and is a no nonsense guy when it comes to the weather and said what was exactly on his mind or what he was thinking. Every moring before we would leave the hotel or right as we left the hotel he went into detail of the days plans and what he thought the weather might be like or where we needed to be. He explained things in a down to earth way for us to understand and he answered all of our questions even though many of them were repeted over and over. The thing I liked the best about Lanny (the tour guide) was that he was professional when he needed to be but his excitement about the weather was almost contagious to everyone in the van. He got so excited and this helped us tour guests get excited. It was almost like a kid in a candy store seeing the smile on his face which made us all smile. Once again, I have thought long and hard about this tour and tried to find any thing that sticks out as a negative or something that I didn't like. I just can't. Lanny went above and beyond as a tour guide to get us weather and tornadoes but also making sure we were comfortable, having a good time all while being very very personable. He is a very personal and intense guy who takes his job seriously. I believe he was even a little sick and a few times he got sick and threw up. But he was bound and determined that we had a good time and saw some weather and ultimately some tornadoes. Lanny would explain to use what we were seeing on the radar on his iPad or iPhone and then explain to us as he was pointing out features such as the "wall clouds", "supercells", "collar clouds", "inflow" and when it was getting ready to "produce a tornado". He actually told us that the storm to our south was the storm of the day and that it would produce a tornado. After driving towards it for miles, it did produce a tornado in Colorado to start. Which amazed us all to say the least. To me, Lanny not only totally understands weather but you can tell he is in tune with it and he loves it. After doing some research well before the chasing tour, and even after since, I have decided to reserve my seat with Lanny and Extreme Chase Tours for next year. In fact, I have already paid my deposit. That's how good this company and Lanny is. I would highly recommend this company to anyone who wants the excitement but still wants to feel safe. They know what they are doing! Our Tour was in a smaller type silver van. It was very comfortable and had plenty of leg room and everyone had a window seat so we could all look out the window and see what was going on at all times. You do spend several hours a day in or near the van, but that is expected and was outlined on their website so I understood this from this beginning. But it comfortable and Lanny even had drinks available for us in a cooler in the van. I booked this tour after doing a little research and decided to go with Lanny and his company. I chose to go the last week of May as Lanny described that time as having the best potential to possibly see a tornado. Spent a little time talking to him on the phone before booking the tour to get a feel for him. He was very helpful and for sure knowledgeable. The tour started out from Tulsa and we chased all over Oklahoma, Kansas, Texas Nebraska and even went into Colorado. The tour itself was amazing. I made lasting friends and had a wonderful time. Both Lanny and Eric were professional but not stuck up. Lanny is probably one of the funniest guys I have ever met and was glad to share his humor on the tour. We chased everyday except for arrival day and the leave day. We saw 5 super cells and 1 tornado which was the most amazing thing I have ever seen. The tour was great and no I had no problems with it at all. I am planning on going back next year with them. Lanny was my tour guide and as described above he is a very down to earth funny guy. He is also very knowledgeable about the weather. More so than our local meteorologists or weather people. I would say that Lanny made the best out of the tour. He trained us and taught us what we were looking at. I would go with him again and plan on next year. The tour car was fine. It was comfortable. It had weather gear on it and radar as well which we used a lot. I brought a very large suitcase and that took up a lot of room so I would recommend to everyone that they pack a little smaller for more room. Great car. This was my first tour. I will say they spared no expense to get us to the storm locations. When I saw other tours watching the storms from five miles away they took us as close as possible. The tour guides were very helpful in showing us how storms form and what to watch for. They were trying to teach us the art of storm chasing as well. We had good hotels at night and stopped for some pretty good food. The guides also gave us pointers on how to take pictures, pointed out cloud formations which would produce storms and one that wouldn't. Everyone on our tour had a good time. It was a good learning experience. Booked for 2016. The tour guides were great. They really tried to make the tour a learning experience. Vehicle was ok, plenty of leg room, If more than six people on the tour might be tight inside. For having rode just about 4,000 miles in one week, we did ok.
My husband and I decided to go on a storm chasing tour as a vacation in 2013. We had gone on one other tour with another tour company in 2010 and decided to go with someone else. After a lot of research, we decided to go with Extreme Chase Tours. We contacted them by email as instructed. Laura replied within the hour by email and this help us feel very comfortable. Laura explained everything about the tour and answered all of our questions. This obviously diminished any concerns we might have had. You are required to pay the deposit first and then pay the remaining balance, which also was no problem. We then discussed how we would get to Tulsa. My husband decided that we would just drive down considering that we live only 5 hours away. We started looking at locations to park our car for the duration of the tour. It was then that we totally fell in love with Lanny and Laura. After hearing of our plans through email - they offered us to just leave our car at their house. They actually offered this! We had looked at many places and although it was not real expensive to leave our car at the airport or similar location, they offered to let us leave it at their home and did not charge us anything. We were so thankful for this. When we arrived in town on our arrival date, we chose our motel for the evening and then contacted Lanny to let him know we made it. Lanny had scheduled our dinner or what they call the "meet and greet" for that evening. again, this is another point where we fell in love with Lanny and Laura....they paid for everyone's dinner that evening! We met up the following morning and dropped our car off at their house and off we went. I cannot explain how excited it was to take off knowing you were going to spend the next 6 days on the road chasing weather, especially with folks like Laura and Lanny. We drove most of the day and by afternoon we were in western Kansas. It was vey strange to be driving along under blue skies and then seeing the white puffy clouds start to build. almost as if on cue from what Lanny had explained. Lanny informed us that he thought that a tornado watch box would be issues soon right for the area we were in. And within 30 minutes we saw the tornado watch on the laptop. We had storms explode just west of us but Lanny thought the best storm of the day would be further south. He was looking at the computer and saw what he explained as "backed surface winds" that were stronger to the south. So we headed south to new development near Great Bend Kansas. Lanny went into detail explaining everything that we were seeing and even went into detail as to what he thought was going to happen with the storm we were chasing. Lanny finally said that he was sure we would see a tornado from our storm as it was now producing a very large wall cloud that was rotating. I remember looking at my husband and we both smiled at each other....we were so very excited because we had not seen a tornado with the other tour company we went with. Just a few minutes later Lanny screamed tornado! I might add that his passion when explaining the weather is contagious but when severe weather is occurring like the tornado, you can't help but get so very excited! I simply cannot explain how we all felt and it is probably best to just experience this. We ended up seeing 4 tornadoes that day and some amazing storm structure. My husband who is into photography took some wonderful photos! But the tornado and the big storm are just the icing on the cake so to speak. The emotions felt, the scenes we saw and the education we received was truly the best part of the trip for me. Lanny and his crew knew what they were doing and certainly know how to run a business like this. For my husband, the tour mean so many things as well. As I said, he took some wonderful pictures and had a great time but even he will tell you that the friendships made and the learning that Lanny offered is why we are coming back this year! We can't wait! The tour was comfortable and Lanny and the other guide were very professional although Lanny does like to use colorful language sometimes. But we actually enjoyed this and it helped to make the tour so much more personal. We only experienced one day when we did not have any weather to chase. During this time we went to a local park and took some pictures. I think they handled the non-chasing time very good and tried to give us some other stuff to do, which was very fun. During the trip we stayed in very nice motels and Lanny would even go so far as to check our rooms before we went in. This made us feel extremely comfortable. We simply loved the trip so much that we have reserved our seats for May of this year! Lanny and Laura run a wonderful company and we are so glad that we decided to go with them! We chased in a van which was very comfortable. We had room for our luggage and everyone else as well. Some people who have never gone on a trip like this might not understand how long that you actually have to be in the vehicle. You are literally in the van for hours so it must be comfortable. The van was very comfortable and clean. In fact, Lanny would have the van cleaned out every morning from the previous days chase which I thought went above and beyond. The tour was professional when needed to be, and relaxed once the day's chase was over. Riding with Chris and Allen was a true pleasure. They make a great team for storm chasing. Chris showed in-depth knowledge of storm forecasting. Allan was a great navigator and an exceptional photographer. With their combined talents, we saw 5 tornadoes and several other severe storms throught the week; an experience that I will never forget. Extreme Chase Tours did exactly what I had originally hoped for: to ultimately see a tornado and pique my interest to learn more about storm forecasting through self-teaching. The van was comfortable with 6 people and had opportunities for charging electronics which is much needed for the long hours on the road. People rotated seats each day so that the best views from the road were distributed equally. My review of this tour is pretty simply: Unbelievable! I scheduled this tour with no real idea of what I might encounter. I had never been on a tornado tour and in fact I had never seen a tornado so I was a bit nervous but very excited. The scheduling process was very easy from start to finish so there was no issues with booking. Lanny made it clear that the weather might not be the best but that we should see something. And we saw something indeed!!! Not only did I see my first tornado, but five on the second day of the tour. The tour was very professional from start to finish and very comfortable. Lanny and his team are great at what they do. The excitement of the chase is really captured on the tour, and Lanny knows just how to convey this to all of the people on the tour. I have said it before but, nothing can ever match that moment when your setup in the right spot at the right time and watch mother nature go to work. Certainly an experience I will never forget and encourage my friends and family to experience this as well. As mentioned, Lanny was very "in tune" with what was happening with the weather at all times. His targeted areas always verified and we were treated to 5 tornadoes in 1 day alone! I think that is one of the biggest things that I was impressed with the most. He would discuss his thoughts with all of us in our morning meetings. When we got to an area to chase sometimes the sky would be perfectly blue and then in a matter of hours we would witness massive storm clouds that had gone up. He was able to get us to what he called target areas with great consistency. Our vehicle was very comfortable and included a window looking seat for all of the guests on this tour. I don't believe the vehicle lacked anything as we had radar, internet and all the tools we needed while out on the road. I would give one tip to others who are going on any tour, pack very lightly as there is not a lot of room for luggage. Now, how does one review a tour like this one. The last week of May is usually a great week for storm chasing but this year it really wasn't. On our 6 day tour we just had one real chase day (and two bust days), the rest were down days. So, from a storm chasing perspective there is not much to judge by but I felt very confident we got the best out of what was there (I checked the reports and there was really nothing going on the other days), thanks to Lanny (our tour guide). There were also other anomalies like ECT's normal van being repaired and that Lanny lacked a partner for this tour. This basically put a lot of pressure on our guide Lanny to drive, forecast, position, entertain us, plan for hotel rooms etc. and often everything at the same time. He literally had to use his iPhone for weather updates while driving since he didn't have a driver for this tour and he lacked his laptop stand so he couldn't really use that either. Not the easiest thing to do, I assume. This may not be the typical setup but I could only review the experience under the circumstances of this particular tour. Lanny did a great job to do this two-man job in a rented van! It is difficult to judge a tour that only had one chase day but from that perspective I give it a "strong" 4 and an even stronger 5* for Lanny as a guide, he was great! You can read my full day-by-day description of the tour in the blog, see link above. Lanny tried to 110% to make this weather-wise dull week into a great experience anyway. This was a really hard sell because I had looked forward to the trip for a long time and to only get one real chase day was a BIG disappointment for me. I don't blame Lanny for a second about this, he really went above and beyond to find anything - often staying up until really late to find some storms for us. So, turning this around was a difficult thing to do but Lanny really managed to make it feel like we were a group of friends on a vacation. We went go-karting, laser-tagging etc and had a really good time. He also held an excellent but sad guiding of what happened during El Reno where his good friend Tim Samaras so tragically passed. The vivid details from his own experiences and what likely happened made it feel very real and one could really imagine how it could have been that day. On the one day we actually did chase Lanny forecasted us in the perfect place (TX panhandle) and we had a really good time. He showed a good balance in terms of being safe while still experience the excitement, which I appreciated a lot. I also enjoyed the excitement he showed, when we saw a landspout it felt like he saw one for the first time. This excitement was contagious and brought a really good, positive feeling to the group! Lanny, as a person, feels very genuine, warm and is extremely dedicated to make his guests have a good time. He may not be the guide for you if you can't take some portion of strong language but I liked that, that was just his personality, and it felt honest and real. If there is one thing that could be improved it is the communication (as in e-mail, not on a face-to-face basis). Some mornings there were some confusion on what time to meet up etc. and the information before the tour was quite scarce. Lanny's typical vehicle was being repaired during our tour so he had to use a rental van. Thus, this review may not be applicable to what you may experience when you ride in the original Extreme Chase Tours van. The rental van didn't have a laptop stand, "3G-booster" and some other features that Lanny was quite bummed out by not having. It didn't have Wifi but had an electrical socket, which was quite useful. It also had a DVD-player but we never used it. The seats were the best I have experienced on a tour and there were plenty of room for your stuff. I have not been impressed with the seats on previous tours so this was a nice surprise. But, once again, this was a rental van and the review of the vehicle is not likely to be applicable on future tours. Extreme Chase Tours certainly lived up to it's name over the two weeks I was in the USA. We travelled across many states, saw so many amazing things, visited and met some fantastic people and saw 6-7 tornadoes! During the first week there wasn't supposed to be any weather at all, so our hopes certainly weren't high! However, after travelling to Nebraska, my Father and I literally stood right below a huge, rumbling, rotating Mothership Supercell - which inevitably produced a tornado. Over the course of the next two weeks we saw hundreds of supercells, wall clouds, tornado warnings, beautiful lightening and tornadoes themselves!! Everything was very professional - with Lanny Dean always knowing what was going on with the weather at every second. In the mornings we were always briefed about what was happening for the day - and why we were going where we were going. Every room we stayed in was carefully checked over by Lanny himself, and whenever there was time to sit down and have a nice meal - we were able to do so. Despite not having as much luck with the weather as you would expect on an average May week - every bit of weather that was produced... we were there before it even happened. Where do I even begin... Lanny Dean is one of the most dedicated and wonderful people I have ever met in my life. He was up all night running weather scans and making sure he found something, ANYTHING for us to chase. Even during a week where there was 'no weather' around - he had us right below a huge, tornado producing supercell. He took the time to explain everything he was talking about - so that by the time you left, you were using the correct verbiage without even realising it! My Father and I had the please of Morris and Alexis helping Lanny with the driving - and they were just amazing. So many laughs were had, that despite the gas station food... i'm pretty sure I've come home with a 6-Pack! Lanny and his family have become our family in America. We travelled all the way from Australia and they were just so warm and welcoming that we didn't want to leave (hence why we ended up staying two weeks). If you want a personal, amazing tour - with honesty, and great people... then choose Extreme Chase Tours. You won't find another tour operator with more heart and passion that Lanny Dean. Dad and I rode in two vehicles over the two weeks and both were equally comfortable and well equipped! Room for bags, drinks, food, legs - it was an easy way to travel! Lanny Dean taught me so much on this tour, it was more than a great vacation, it was training on the spot, I had hands on radar equipment, I could understand the formation of the atmosphere and know what Lanny was thinking, you won't get this training and education anywhere else. Lanny is the God of all storm chasers, his experience and the love of chasing storms puts him at the top of all storm chasing vacations . The tour was great. The van was comfortable and clean. Van was cleaned and washed prior to each chase day. The service was amazing. I was picked up at the airport because the storms forecasted for that day were good and the CEO wanted to get right out there and start the chase. We chased down a supercell and after the bad weather was over we watched the most amazing lightening show I have ever seen for about 2 hours. It was a long day but as tired as we were...Lanny checked my motel room before I entered to make sure that the air conditioner was working, sinks and shower worked and to make sure the toilet flushed. He did this every night in every hotel. On the down day, him and his wife made plans to explore the town of Longmont Colorodo and we went to a very cute restaurant. They picked up the tab which was extremely gracious. I will never look at clouds the same. I came home with such a wealth of information regarding clouds, what they all mean, updrafts, downdrafts, dew point, wind shear, CAPE. You will all know what I am talking about after this tour. It was wonderful!!! I will be back. Lanny is truly an amazing host and tour guide. He explains everything that is happening as it is happening. His excitement his genuine and you can see how he has turned his passion into something amazing. I have come home with so much more knowledge about storms, tornado's and cloud formations. If there was a storm....Lanny could find it. Vehicle was clean and comfortable, plenty of room. If you are looking for a private and professional stormchasing tour don't bother looking anywhere else. These guys are the real deal! I have been with other stormchasing tour companies and just the way these guys interacted with us was so much better. We filmed over 8 tornadoes with Extreme Chase Tours in a week! These guys are the best in our book and will go above and beyond what is asked! The thing my wife and I liked the most was the way Lanny and his staff interacted with us. I have personally been with 3 other tours companies and by far, this one was the most educational and fun. They explained everything from what we were seeing to actually teaching us how to read their radar. We learned more in 6 days with Extreme chase tours than we did with going on tour with others for 10 days. It was truly a wonderful experience and one my wife and I plan on doing again in 2010! I took my first tour with Extreme Chase Tours in 2007 and have not stopped since! Each year I spend 10 days on the tours and it is the most fun filled 10 days I have during a year I would definitely recommend Extreme Chase Tours as a great vacation. Lanny, Eric, JD and Jim as well as the entire staff are really good at making storm chasing the experience of a lifetime. 10 out of 10 for me!